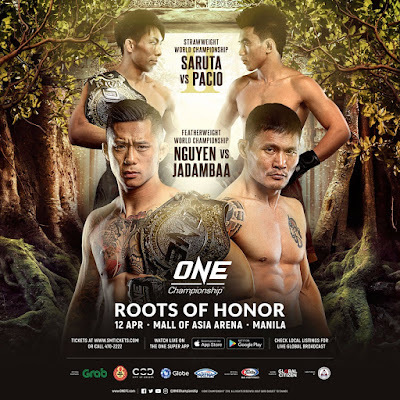 18 March 2019 – Manila, Philippines: The largest global sports media property in Asian history, ONE Championship™ (ONE), has just announced additional bouts for ONE: ROOTS OF HONOR, which is set to take place at the Mall of Asia Arena in Manila, Philippines on 12 April. 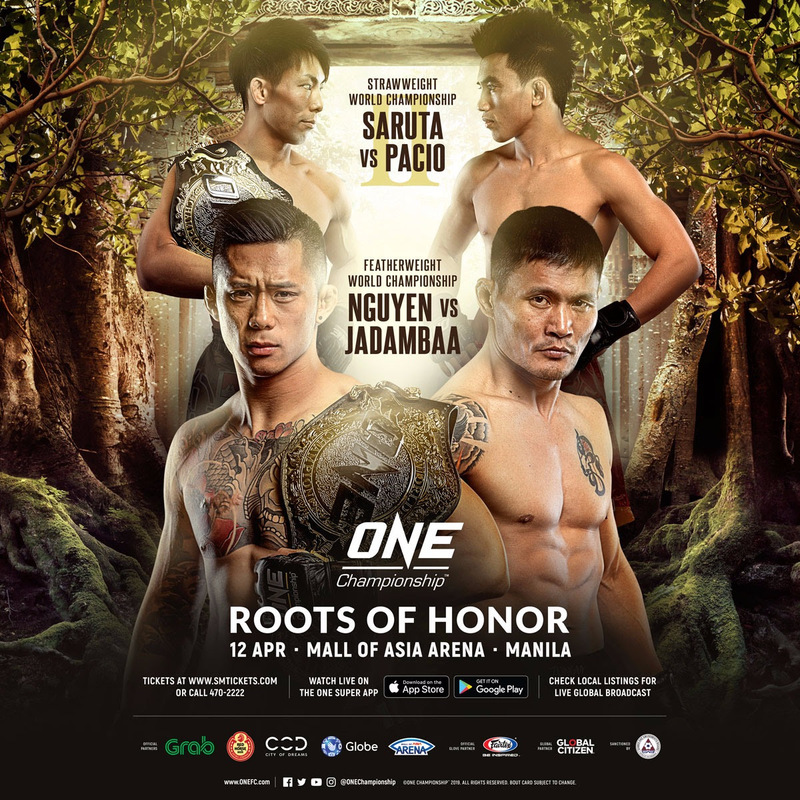 Once again, the absolute best in local and international martial arts talent will grace the ONE Championship stage and showcase their world-class skills. Brazilian Jiu-Jitsu World Champion Leandro “Brodinho” Issa of Brazil is back to take on former CKF Champion Fu Chang Xin of China. Issa, who represents Evolve in Singapore, is a winner of three of his last four bouts, which includes two exciting finishes. Meanwhile, Fu, who is a boxing, wrestling, and taekwondo specialist, has won his last five bouts, which includes three stoppages. The two streaking martial artists are on a collision course and should provide fans with an intriguing match-up. Dutch-Moroccan kickboxer Ibrahim “Mr. Cool” El Bouni looks to put himself back on the right track when he takes on Andrei “Mister KO” Stoica of Romania. El Bouni split his first two appearances for the promotion but has impressed in both outings with his world-class striking skills. The former A1WCC Kickboxing World Champion aims to make 2019 a year to remember, starting off by taking on a dangerous knockout artist. Stoica recently made his ONE Super Series debut at ONE: REIGN OF VALOR. The former SUPERKOMBAT Cruiserweight World Champion is known for his power and technique, as well as his warrior spirit. Stoica looks to make a statement against “Mr. Cool” in his return. Filipino martial arts veteran Edward “The Ferocious” Kelly will take on South Korean grappler Sung Jong Lee. Kelly, a Philippine Featherweight Champion, is well-versed in both the striking and grappling arts. A senior member of the famed Team Lakay of Baguio City, Kelly is best known for his 21-second knockout victory over Cambodia’s Meas Meul in January 2018. He aims for the same result against Lee. Lee is a NAGA No-Gi Grappling Champion, and one of the craftiest submission artists in the ONE featherweight division. A representative of 10th Planet Jiu Jitsu in his native Korea, Lee will put his mat skills to the test against a world-class wushu champion in Kelly. In a ONE Super Series Kickboxing contest, Andre “The Giant” Meunier of Australia takes on Anderson “Braddock” Silva of Brazil. Meunier, a four-time Kickboxing World Champion, will welcome Silva to ONE Championship, as the latter makes his debut for the promotion. Former ONE World Title contender Eric “The Natural” Kelly of the Philippines is looking to make a lasting impression when he returns to action to face China’s Tang Kai. Kelly had a blazing start to his mixed martial arts career by winning his first 12 professional bouts. In February 2013, he competed for the inaugural ONE Featherweight World Title, falling short against Filipino compatriot Honorio Banario. A year later, Kelly came back and put together the performance of a lifetime when he submitted tough Australian Rob Lisita. Now after revitalizing his training camp, Kelly looks to reignite his career against Tang. Tang, a WBK Tournament Champion, is a boxing stylist known for his fast hands and aggressiveness. The Dragon Warrior Shanghai representative is a winner of his last four bouts, all of which have ended in explosive knockouts. Against a veteran like Kelly, Tang’s striking skills will be put to the ultimate test. In a ONE Super Series Muay Thai contest, Thai legend and former MTGP Welterweight World Champion Saemapetch Fairtex takes on former Lion Fight Lightweight World Champion Ognjen Topic. Both Saemapetch and Topic are top contenders in ONE Super Series, and the two will figure in a highly-anticipated bantamweight showdown. Singaporean flyweight prospect Niko Soe is set to take on freestyle wrestler Eko Roni Saputra of Indonesia. Soe is a winner of his last two outings, and he aims for his third straight victory against Saputra, who is making his mixed martial arts debut. In a ONE Super Series Muay Thai contest, the legendary Lerdsila PhuketTopTeam of Thailand will showcase his fistic talents against Japan’s Kohei “Momotaro” Kodera. Kodera, a former WBC Muay Thai International Champion, just recently scored a thrilling three-round unanimous decision victory over Kenny Tse at ONE: REIGN OF VALOR. Lerdsila, on the other hand, is an absolute legend in Muay Thai with over 200 professional bouts. Kodera and Lerdsila promise to produce fireworks for fans in attendance at the Mall of Asia Arena. Vietnamese-American female atomweight contender Bi “Killer Bee” Nguyen is set to make her much-awaited ONE Championship debut opposite Indonesia’s Dwi Ani Retno Wulan. Nguyen made her foray into mixed martial arts in 2014, winning four of her five matches in the amateur ranks in impressive fashion. She turned professional in 2016, and she immediately racked up three straight victories to kick off her career. Now, “Killer Bee” directs her career path to ONE Championship, where she is set to make her promotional debut. Wulan, an Indonesian Muay Thai Champion, made her professional mixed martial arts debut just last November, defeating Putri Padmi by unanimous decision. She looks to build on her momentum by defeating “Killer Bee” in Manila. Finally, National Kyokushin Karate Champion Ramon “The Bicolano” Gonzales of the Philippines and Akihiro “Superjap” Fujisawa of Japan will square off in a three-round strawweight contest.